Hi everyone. 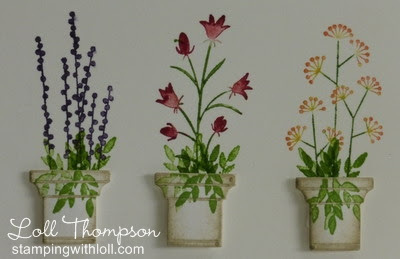 Continuing to experiment with my flower box die ... turning it into pots. 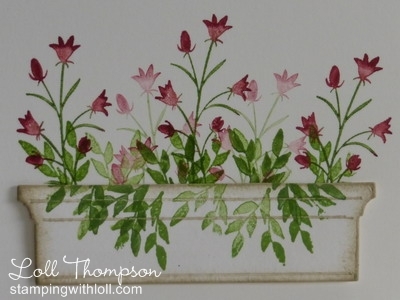 This time I used the Small Flower Box die from Poppy Stamps. I had a hard time getting the three pots the same size, so will have to figure out a process. Even though they aren't perfect, still loving this card and another way to use an old (and well-used) stamp from SU! called Pocket Silhouettes. Same process as yesterday ... but I have just now realized that I didn't give any details, so in case you're interested in how I did this - here goes. Masked my card front 1 1/2" from the bottom. Placed my flower box die on top of the mask at the top and marked with a pencil at both ends ... this is to make sure I don't stamp flowers that would be outside the box. Remove die and then inked my leaf sprig and stamped three times, including a second generation stamping with each pass (this gives lighter stamps that look like they are in the background and creates the illusion of depth). Did the same with the flowers, inking the stamp with my Stampin' Write markers and stamping and stamping again before reinking. Also added some leaf sprigs on the flower box. Removed the mask, stamped the sentiment (just got it in the mail today from C.C. 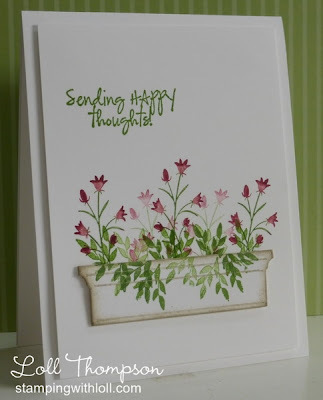 Designs) and then popped up the card front on the card base and added the flower box (also popped up for added dimension). Do love the two-tone tulips and the bright green leaf sprigs. Labels: Amy R, CAS, friendship, Rubbernecker stamps, second generation stamping, sponging, Stampin' Up! Love both cards. 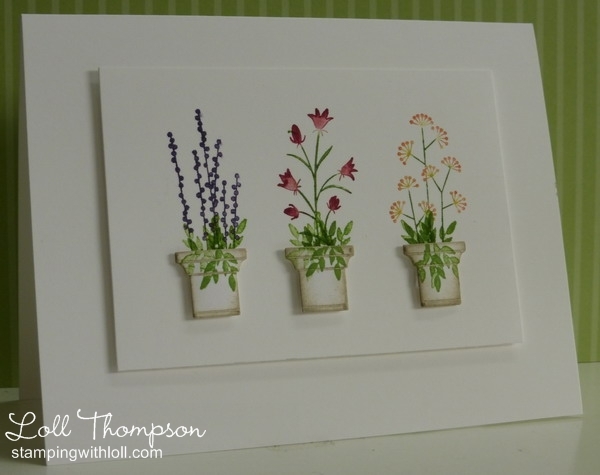 With the little flower pots I reckon they are a perfect size so the card doesnt look too crowded. Love the red flowers. I have never thought of getting a flower pot die but now you have me rethinking. Beautfil work. I think 3 are enuff on the card.. I really love both these cards, but the first one is my favorite, wonderfully done!!! I have to try and redo your first one!! Just fell in love with it. This card is absolutely gorgeous Loll and I don't think you should have put more flower stems - perfect as it is. Love the window box card as well but the flower pot is my favourite. I love these cards. Very artistic and eye catching. I love everything that you do, you never disappoint. Love them both! Thanks for the info on stamping the flowers for the flower box one. And when you figure out how to get your flower pots the same size, please let us know! Although I think they are fine even if not the same size - think of them as rustic hand-potted pots! Really loving what you are doing with this windowbox die. Simply marvelous. Love the cheery flowers, and thanks for explaining how you achieved the stamping. Off to check on the sentiment die. Wish you lived closer, so I could enjoy your classes. TFS such a beautiful card. I love both of these cards! Thank you for sharing! Gorgeous cards Loll. Two lovely images. These are so beautiful, feminine and fresh! I love the color tones. What a beautiful (and CLEVER) use of the window box die. I just love this card. I love your cards with the flowerpots. Thank you for sharing!